As night-time approaches in Sanliurfa, southeastern Turkey, most of the alleyways of the city’s old bazaar are emptying out, except for one. The bustle of daytime trading has died down, but on this little street, a stream of men carry cardboard boxes filled with pigeons to a cluster of three teahouses. 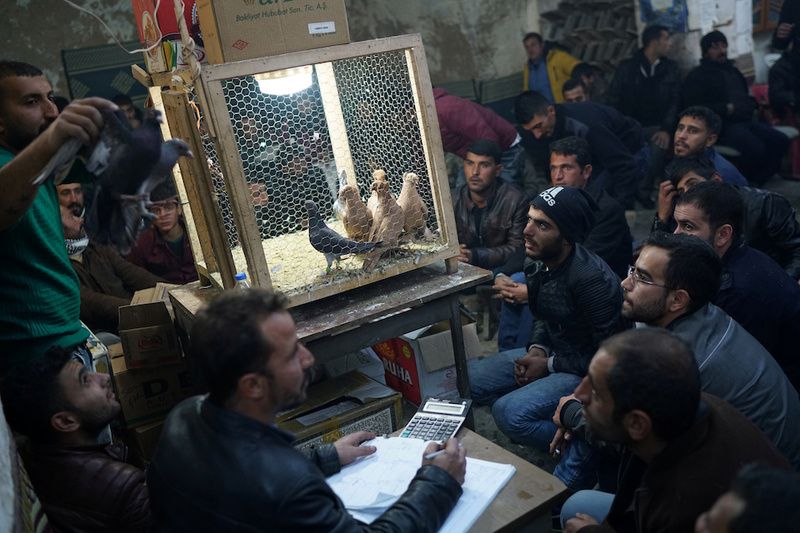 Here, they sell the birds at Sanliurfa’s famed auctions to a dedicated band of pigeon keepers and breeders, a pastime that has been thriving for hundreds of years across the region and over the nearby border into war-torn Syria. In a country where the minimum wage is about 1,400 Liras ($367) a month, enthusiasts regularly easily spend hundreds of dollars for one bird. Sanliurfa sits just 50km (30 miles) from Syria, in a southeastern region rocked by its own clashes between government troops and Kurdish insurgents. But the trade has taken the turmoil in its stride and carried on. In the early days of the conflict next door, there was a glut of birds on the market as enthusiasts from northern Syria fled into Turkey with their pigeons. 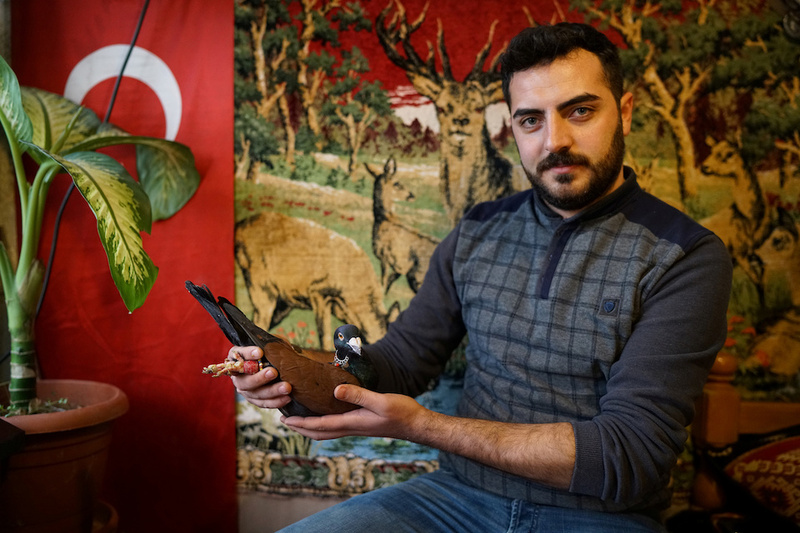 “Prices fell due to oversupply but as the conflict escalated and there were no more pigeons coming from Syria, prices rose again,” says 23-year-old breeder İsmail Ozbek. 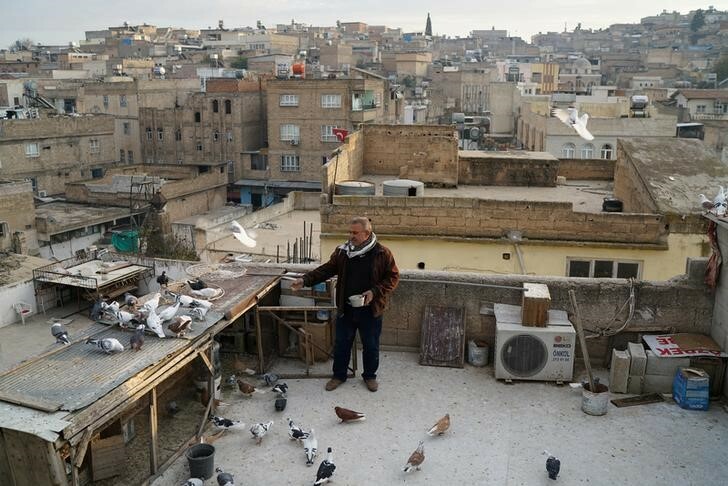 He keeps about 200 pigeons – together worth about 50,000 lira – in lofts fitted with alarms and closed circuit TV cameras. At the auction, men sip tea and smoke cigarettes as Dildas picks up a bird and shows it to the crowd. He gives a starting bid price and buyers shout out their offers. Prices vary from 30 to 3,500 Lira. Some birds wear silver adornments on their feathers or feet to boost their value. At the end of the night, Dildas has sold around 13,000 Lira worth of birds. His commission is 10 percent. When they are not trading, most of the city’s pigeon fanciers head to the rooftops at sunset and let their birds stretch their wings. Hundreds fill the sky – a familiar sight in the city – before following their training and heading home. “The birds are my friends. They give me peace,” says 55-year-old enthusiast Resit Guzel. He gives his 70 birds quality feed and regular vitamins. “Upkeep … costs 5 Lira a day, which is not much. Even if it cost me more, I wouldn’t mind,” he says.